Corey McKernan will always be remembered as a North Melbourne star; a trail-blazing 196 cm ruckman–forward with pace, strong hands and genuine all-round skills. Between 1993 and 2001, he racked up 182 games and 233 goals for the Kangaroos, and played in their 1996 and 1999 Premiership teams. 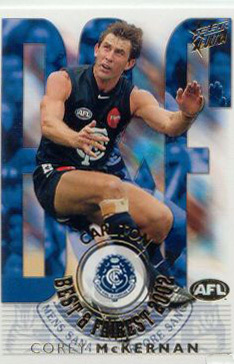 But he was also Carlton’s Best and Fairest – and leading goal-kicker – during two seasons at Princes Park in 2002 and '03. With a little more luck early in his career, McKernan might also have won the Norwich Rising Star award in 1994, and even more importantly, the 1996 Brownlow Medal. He finished equal top of the voting in both awards, but because he had been reported and found guilty during those seasons, he was ruled ineligible for either. Perhaps the only downside to McKernan’s game was that he was prone to inconsistency, especially after his second Premiership triumph. His relationship with his coach at North Melbourne; Denis Pagan, was always somewhat fragile, so it was no real surprise when the Roos put the 28 year-old on the trade table in 2001. Carlton snapped him up in exchange for our popular and reliable ruckman Mark Porter, plus draft selections 14 and 30, in a continuation of Carlton's trade strategy of that time that often saw us give up early picks for other clubs’ fading stars. That strategy would come home to roost for the Blues, as McKernan bore the brunt of high expectation from Carlton supporters who were generally unhappy with the price we paid for him. To make that situation even more difficult, McKernan’s first season in 2002 was the worst in the club’s history. Poor trade choices, injuries to key players and ever-sagging morale culminated in Carlton’s first-ever wooden spoon after 105 years in the VFL/AFL. McKernan struggled to make an impact in the early part of 2002, but while others fell by the wayside around him, he battled on manfully and just got better as the season dragged through to its horrendous conclusion. Having not missed a match all year (and finished on top of Carlton’s goal-kicking with a handy return of 40 goals) McKernan found redemption when he was a deserving winner of the club’s Best and Fairest award. In his acceptance speech, he paid tribute to Carlton’s embattled coach, Wayne Brittain, who McKernan said, had shown patience and confidence in him. Sadly, that relationship had very little time left. Before the end of the year, Carlton’s committee - under President John Elliott - sacked Brittain, and to McKernan’s alarm, recruited Denis Pagan from North Melbourne. For both Pagan and McKernan, 2003 was not a season of happy reunion, especially after the Carlton Football Club was investigated by the AFL and found guilty of breaching the league’s salary cap regulations. The club was heavily punished by fines and national draft exclusions, before Elliott was forced from office. As well, the team struggled for success on the field, and we only avoided another wooden spoon because the Western Bulldogs played a draw during the season and finished two points behind the Blues. McKernan played another 19 matches in 2003, but the enthusiasm he had shown in his debut year was a distant memory by season’s end. The inescapable conclusion was that as far as football was concerned, McKernan and Pagan were on totally different wavelengths – so it came as no surprise when Corey requested a trade back to Arden Street in the off-season. Carlton complied with his wishes, and sent him back to North Melbourne in exchange for two other Kangaroos destined to make their mark with the Blues; David Teague and Digby Morrell. Purely in light of their contribution, the McKernan experiment must be considered a success. While McKernan played another 14 games at Arden Street before retiring at the end of 2005, Teague and Morrell managed 82 senior matches between them, and their off-field contributions to Carlton continued long after their playing days ended. McKernan’s name briefly returned to the sports pages in 2007, when he came out of retirement to pull his boots on again with Heidelberg in the Diamond Valley Football League. In his first game back, he led a powerful on-ball division that also included two other former Blues in Anthony Franchina and Justin Murphy. Contributors to this page: Bombasheldon , pblue , PatsFitztrick , molsey , true_blue24 , WillowBlue , BlueWorld and Juzz . Page last modified on Thursday 06 of June, 2013 21:05:02 AEST by Bombasheldon. 2011 - Australian Golfer Stuart Appleby.